Please note the CTA bus Route 8 stops right in front of the building. There’s also plenty of free street parking all within short walking distance. At the VTSDA classes are conducted in a combination of formal and informal training. For some of the time, students are given directed instruction, in other words they are guided thru forms, drills etc. that will advance their skill and understanding. Time is also given for free training, what we refer to as “Hong Kong” style training. This is the way most classes are run in Hong Kong, including Sifu Ip Ching’s class at the VTAA. During this part of the class students are free to work on whatever aspect of the system they want to focus on, and work at their own pace. It might be forms, chi sau practice, wooden dummy practice, heavy bag training, self defense training, etc. 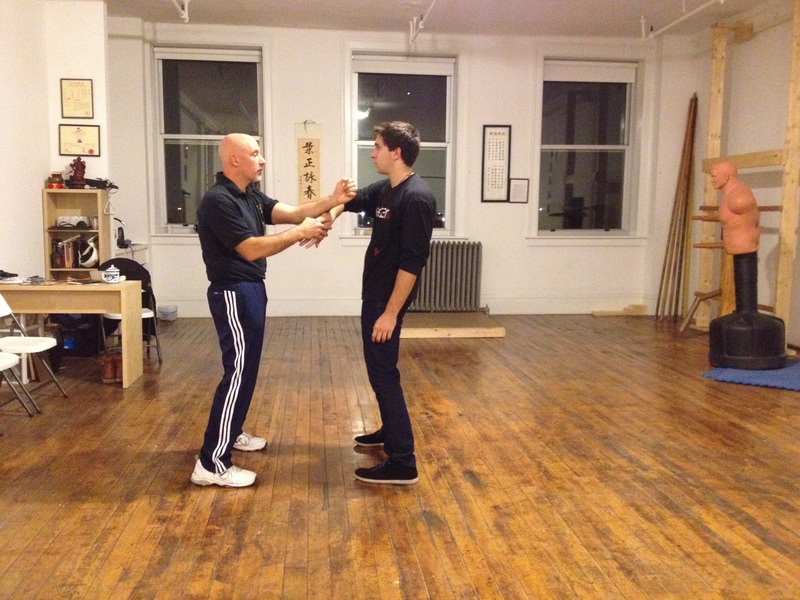 During this part of the class Sifu Matt will observe the students training, go from person to person to answer questions, make corrections, do Chi Sau, show the next part of a form, etc. This type of training makes it possible for students to develop at their own pace, and in their own way, understanding how to make the system work for themselves instead of constantly being told what to do and how to do it. In this way of training, they learn to make the Ving Tsun their own. In a students early stages, much of the time is spent in structured training with Sifu Matt or an assistant instructor of the academy. This ensures that they get the best possible foundation and that the fundamentals of the Ving Tsun system are understood and thoroughly trained. If these fundamentals are solid, the students Ving Tsun will be good and they will progress the fastest in the long run. Like Sifu Matt always says, “Having a high level of skill in Ving Tsun comes down to having good solid fundamentals.” This unique way of running classes is not common in most martial arts schools, but it ensures the best and fastest possible progress for the students. Here at the Academy we offer both daytime and evening classes 5 days per week to fit your schedule.